Rising out of the ashes of war, Ikea spent the second half of the 20th century developing ways to flat-pack furniture. The cabinet industry has learned a lot from Ikea’s successes and failures. The company’s knock-down concept paved the way for hundreds of innovative and ingenious fasteners that, in conjunction with a concurrent evolution in CNC, have driven a revolution in cabinetmaking. 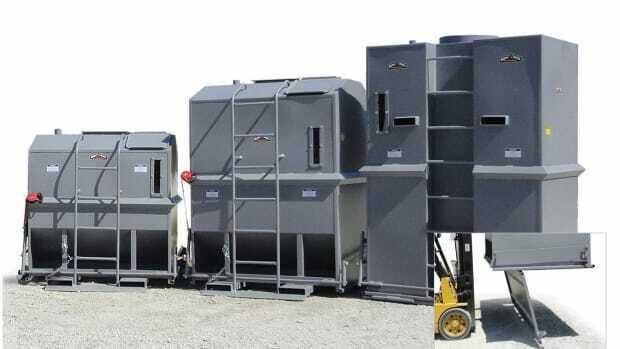 Today, woodshops can outsource components and have them delivered to the jobsite for assembly, or stockpile inventory in small spaces so that casework can be assembled and filled in short order. Hidden fasteners allow the industry to by-pass the time that was once spent milling dadoes and rabbets, waiting for glue to cure, clamping and unclamping, and a host of other tasks associated with assembly. They have allowed a lot of shops to sell the big delivery truck and just have an entire kitchen arrive at a customer’s home on one or two pallets that can be stored in a garage bay and be assembled in a few hours. Hidden fasteners take many forms. There are simple mechanical ones that are well suited to small shops and jobs, such as the familiar threaded inserts, T-nuts and cross dowels. And there are sophisticated versions that are designed for industrial volume and CNC insertion. 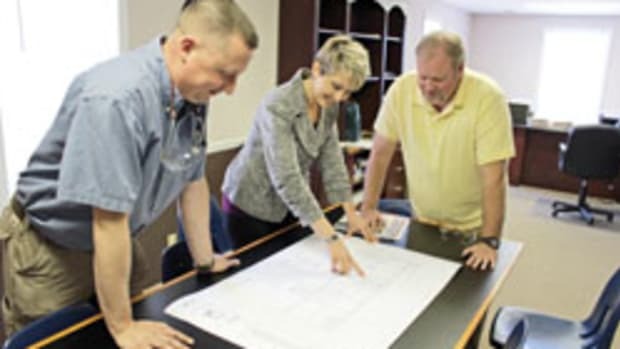 Lockdowel (lockdowel.com) provides fasteners, drawer slides and hinges for fast and easy installation of cabinets, furniture, closets and architectural millwork. The company has just released its new Mini Barbed Channel Lock, which is a simple solution to fastening half-inch and thinner boards. Not just a downsized version of the standard Lockdowel hidden fastener, the new addition resists at least 70 lbs. of pull force and is ideal for drawer boxes and cabinets. It comes in nylon and metal and has a sheer force of over 50 lbs. Once inserted, it can be disassembled for reassembly. Lockdowel has also introduced a new online store that is designed to be very user-friendly. It instantly lets woodworkers see and find what they need, including up-front pricing and carton quantities. For those who are not familiar with the system, there’s an “Applications” tab on the homepage and a downloadable catalog. About a year ago, California-based CNC Factory (cncfactory.com) introduced the Scorpion LDR is an easy-to-use, fast and affordable machine that reduces the process to an easy ‘snap or slide’ sequence. It has four working zones, automatic material loading, laser guided robotic measuring and advanced wireless barcode reading. A single employee can run it, using software by Cabinet Vision, Mozaik, Top Solid, Solid Works, Microvellum and Imos. 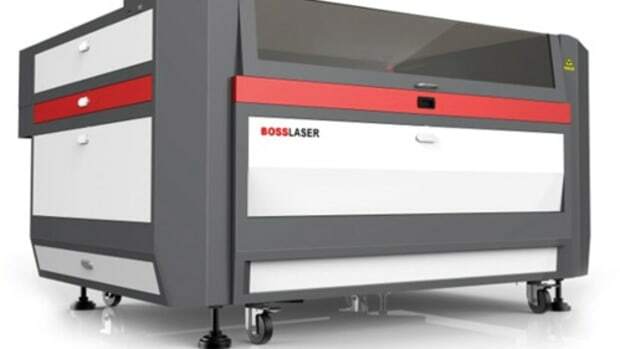 Laguna Tools (lagunatools.com) also has a new boring/inserting machine for cabinet manufacturers that use Lockdowel fasteners for cases, drawer boxes, closets, desks, solid wood furniture and many other applications. It drills and inserts E-clip products and, when used in conjunction with a SmartShop CNC router, creates a complete fastening solution. The LD4 has four zones and two drilling units - one for 5mm and one for 8mm. Its two vibratory barrels have the ability to insert 30mm or 40mm spring pins and E-clips, H-clips or channel locks. Fastenlink (fastenlink.com) has a different take on dowels. 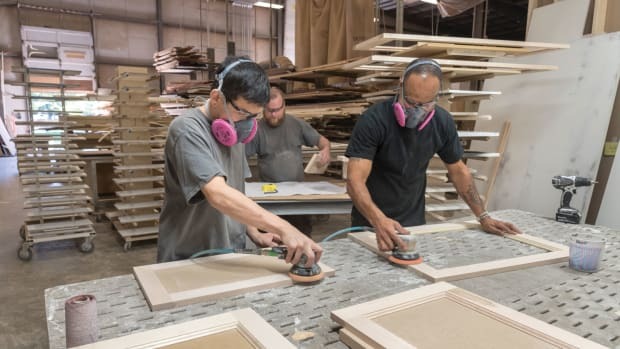 The company’s system uses standard woodshop equipment and one end of its specially shaped plastic dowel goes in a hole while the other slips into a ramped slot. Slide the parts and they lock together. It’s fast, easy to get into, economical, and above all simple. Installers can assemble RTA casework on the jobsite with little more than a rubber mallet. For CNC applications, it’s supported by Cabinet Vision, Microvellum, WoodCAD/CAM and KCD software. Häfele America Co. (hafele.com) offers a clever little connector called the SC 8/25 that is essentially an expanding dowel. After a woodworker drills a couple of 8mm holes, there’s no need for tools, glue or clamps to assemble smaller pieces of furniture. They just push together, and as they slide into the holes they ratchet, expand and lock in place. The company also has some push together hidden panel connectors. The Quickfit TL5 Full Metal Jacket is a new type of dowel joinery from the Slovenian company Titus (cabinet.titusplus.com). This hidden fastener is essentially a metal dowel with an expanding steel sleeve that creates high resistance to torsion and dowel pull-out. The resulting joint won’t loosen through time, even with repeated assembly/disassembly. The dowel goes in one part, and a little cam that can be tightened with Phillips a screwdriver goes in the other. Lamello USA, a division of Colonial Saw (csaw.com), the Cabineo fastener at AWFS 2017. Not quite invisible, it’s still somewhat hidden. The ready-to-assemble cabinet connector was developed by Lamello AG in Switzerland and calls for fewer processes than a standard cam and dowel fitting. There is no need for edge drilling or wooden dowels. The fastener can be inserted into a surface-only routed groove on the cabinet components during production or at the final destination. When installed at the woodshop, they are easily flat-packed for transport and end-users don’t need to deal with loose fittings. 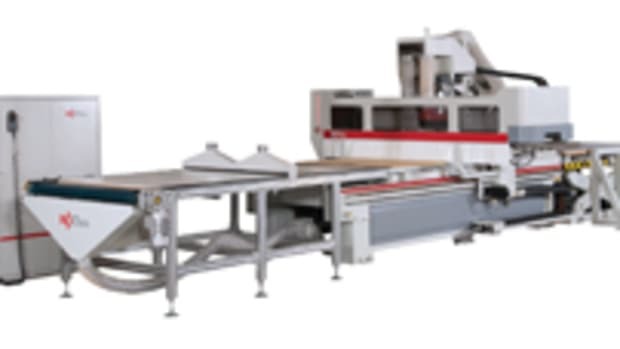 Cabineo can be used with a wide range of CNC machines, including very simple 3-axis and nested-based machines. Woodworkers can install the finished product with just a cordless drill in a few seconds. Optional decorative cover caps are also available in a variety of colors (there’s the ‘hidden’ part). Lamello has also developed the Invis. The woodworker sets up and uses supplied jigs to locate and bore holes in the parts to be attached, and then taps home connectors in these holes that look like ribbed metal dowels. Next, a small plastic box with magnets is chucked into a portable drill. Then, it’s just a matter of lining up the parts and pulling the drill’s trigger. The plastic box is held close to the connectors and the magnets rotate and cause the nuts to spin so they draw the joint closed. It’s easily reversed so that parts can be disassembled quickly, too. 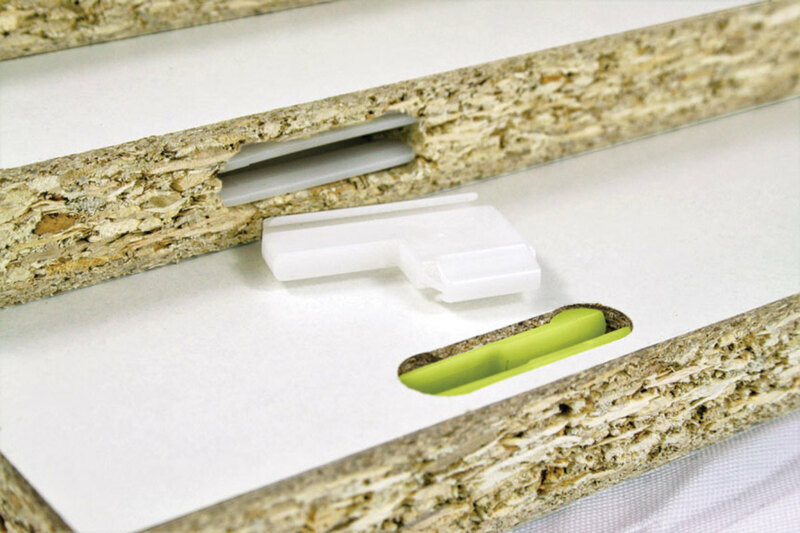 The Irish company Ovvo (ovvotech.com) recently introduced its new V-1230 hidden fastener for high-grade chipboard, available in both permanent and knockdown versions. It is also compatible with high-pressure laminated panels, composite material and solid woods. The U.S. distributor is E.B. Bradley Co. (ebbradley.com). Woodworker’s Supply (woodworker.com) has compression dowels, which must be among the very simplest of hidden fasteners. They’re just metal cylinders that expand when installed. Made from spring steel, they don’t require adhesives. They compress evenly along their entire length so, upon expansion, equal pressure is exerted. Simply drill appropriate diameter holes and tap into place with a hammer. One third of the compression dowel should be inserted into flat grain, and the rest into end grain. For building face frames and a host of other tasks, it’s hard to beat the traditional pocket screw system. These hidden fasteners can be used with or without glue, are very inexpensive and lend themselves to jobsite solutions. While the pockets can be milled on a CNC, there are some great jigs available. Kreg (kregtool.com) has been a top choice of small shops for many years, because of the variety of clamp-on and benchtop jigs available. But the company also builds industrial machines, including both electric and pneumatic versions that can create from one to five pockets at a time. The flagship is the DK5100, which has five industrial-grade motors, five individually-activated clamping cylinders, and five drill spindles. It makes easy work of drilling multiple pocket holes across cabinet sides, shelving, stairs or even window and door extensions. The time saved by drilling up to five pocket holes at once can be dramatic. A slightly different, but quite significant take on pocket screws can be found in machines from Castle USA (castleusa.com). 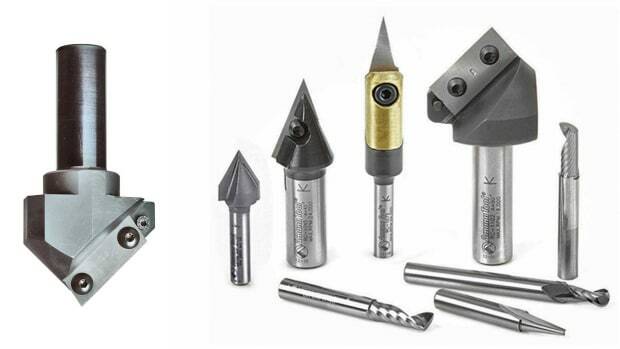 Rather than using a two-step drill bit to create the pocket, Castle uses a single small bit to pre-drill a pilot hole and a router bit on an arc to mill the pocket. One of the Castle machines, the CSI-1.5D, not only cuts the distinctive screw pockets and drills the hole, it also inserts the screws – all in about 1.5 seconds. Castle’s latest innovation is the Model 100, a portable machine designed for the benchtop and the jobsite. Quickscrews (quickscrews.com) has a whole catalog section devoted to pocket screws. The company offers bulk pricing on square drive, Phillips and torx screws in a wide variety of lengths and threads. Woodshops can choose these self-tapping screws in plain, zinc and yellow zinc coatings. As one might expect, Festool (festoolusa.com) is a leader in the field of hidden fasteners. 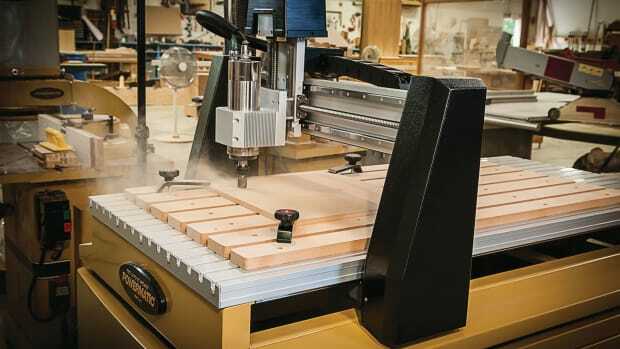 Building on the Domino joining system’s wooden tenon technology, the company has created a whole family of hidden fasteners that are housed in Domino mortises. The newest generation of Domino connectors for knock-down joinery are designed to quickly and easily assemble, separate, and reassemble work across a wide range of application, from corner panel joints to center panel joints to joints between a series of holes. All joints are simple and quick to machine using the Domino DF 500 joiner. Also building on centuries of mortise and tenon joinery, the Beadlock Pro Joinery Kit from Rockler (rockler.com, item 37801) delivers concealed joints with just a hand drill. The Pro kit also has the ability to create traditional smooth-sided mortises. Just pop the included paring block into the jig to provide an accurate guide for a chisel. With a 3-1/2” width capacity, this system will easily handle the large joints found in tables, chairs and big casework. California’s Glaser Bolt (glaserbolt.com) distributes the TorpedoCSIS, a connector designed for use with existing designs of Ikea and other modular furniture. There are three elements here – a shaft bolt, a housing and a grub screw. The bolt slides into the housing and the grub screw locks it in place. There’s a countersunk hole in the bolt, and a pin on the end of the screw slides into that and tightens the joint as it seats. There are a number of accessories available. Striplox Mini 120 fasteners (online at joinlox.com) deliver a very inexpensive yet tight and strong joint, either in a permanent or reversible configuration. The installation uses existing manufacturing methods and delivers a fast assembly of components, panels or sections either in the factory, in the home or in the most remote site locations. The Mod-eez system (mod-eez.com) uses a spring steel declining ramp and a large collared screw as two mating members. Spring steel makes the joints strong, yet flexible, while the collar on the shoulder screw adds tremendous resistance to torsion pull-out. Just slide the screw head down the ramp. Lee Valley & Veritas (leevalley.com) offers the Button-Fix Panel Coupler. A 3/4” diameter ‘button’ is attached to the face of a flat panel, close to the edge. Then a matching socket is screwed to the second component. They lock together with an audible click, so you can be sure all parts are properly joined. Fastcap (fastcap.com) offers blind nails. These create an invisible mechanical connection: simply drive one end of the two-headed nail into one part until it stops, and then tap the second wooden part in place. It’s old-fashioned and no Ikea hidden fastener, but it’s still quite effective and works well with glue.